Masaya Volcano National Park, one of Nicaragua's most interesting and beatiful natural phenomena. Esblished in 1979 as the country's first national park, it comprises an area of 54 km2 with more than 20 km of scenic roads and trails, leading to and around the two impressive volcanos and five formidable craters. The Masaya Volcano, also known as POPOGATEPE meaning the "MOUNTAIN THAT BURNS" in the language of the indigenous Chorotega tribe One of its craters, Santiago, currently displays gaseous activity and incadescent lava in its interior. During the pre-Columbian age, Masaya Volcano was on object of veneration by the indigenous people. They believed the eruptions were signs of anger from the Gods and to appease them they offered sacrifices, which ofter included small children and maidens. During the Conquest, the Spaniards baptized the active Volcano "LA BOCA DEL INFIERNO" or "THE MOUTH OF HELL". They then planted a cross, "LA CRUZ DE BOBADILLA" (named after Father Francisco Bobadilla). It was placed on the crater lip in the 16th century in order to exorcise the Devil. In 1670, the Nindiri Volcano made its last eruption followed by the Masaya Volcano in 1772. The lava formed by this later eruption advanced like a river of fire to the area now known as "PIEDRA QUEMADA" or burnt rock. 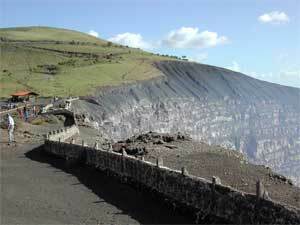 In 1852, a new crater Santiago, was formed between the two existing volcanoes.